Lucas Cranach the Elder was one of the most important artists of the German Renaissance together with Albrecht Dürer. He was a noted portraitist, an area in which he was particularly prolific following his appointment as Court Painter at Wittenberg. Cranach executed various portraits of the Emperor Charles V, the first when the sitter was aged only eight and was Archduke at the court of Margaret of Austria. In the present portrait the Emperor is depicted bust-length, his body outlined against the green background. The depiction of the face is not idealised and reproduces Charles’ distinctive features with his prominent jaw and bulging lower lip. The only element that refers to his royal status is the emblem of the Golden Fleece hanging from the chain that he wears. Portraiture constituted an important area within Cranach’s oeuvre as it was part of his repertoire from the outset of his career, increasing in terms of number of works from the time of his appointment as court painter at Wittenberg. Among his earliest portraits was that of the humanist Johannes Cuspidian and his wife Anna of around 1502–3 now in the Oskar Reinhart collection in Winterthur. The couple are posed more than half-length, seated outdoors with extensive landscapes behind them. Cranach used landscape settings on specific occasions for his bust-length portraits but these were often replaced with plain backgrounds in bright colours. Cranach painted his first portrait of Charles V (Ghent, 1500–Yuste, 1558) in 1508 during a trip to the Low Countries that he made in the autumn of that year. Little is known of that work, which has not survived, in which the artist depicted the eight-year old future emperor when he was Archduke at the court of Margaret of Austria. The second meeting between the painter and Charles took place in 1547 after the battle of Mühlberg when Cranach interceded before the monarch for John Frederick of Saxony who had been taken prisoner during the battle and condemned to death. Charles is depicted bust-length against a plain green background with the light falling from the left, his head turning towards the viewer. The only indication of the rank of the sitter, who is easily identifiable from his physical characteristics, is the chain with the emblem of the Order of the Golden Fleece. The chain is formed from alternating flame and flint-shaped links with the Fleece hanging from the centre. Charles is depicted in numerous portraits with this symbol of power but with variations in the two elements, the chain and Fleece, of which it is comprised. 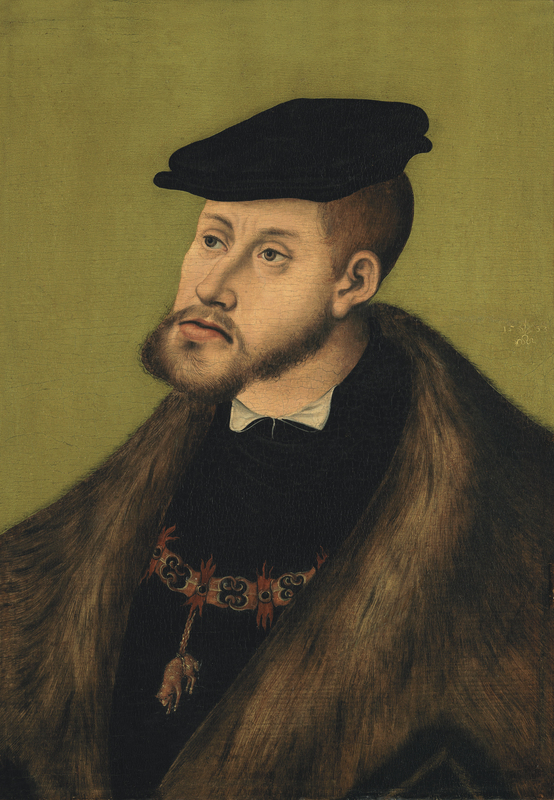 The colour range in this portrait is a limited one, consisting of the black of the clothing and the cap — an accessory used in other portraits of the Emperor — and the chestnut tone of the hair, beard and fur collar of the coat. In this panel Cranach used a format that he had developed and widely used in his court portraits, depicting the Emperor without any type of idealisation. Thus we see the long face with its protruding jaw, partly hidden by the beard, as well as the large nose and fleshy lower lip. This realistic approach contrasts with official portraits of Charles by Titian in which the Venetian artist placed less emphasis on the sitter’s physical defects. The fact that the Emperor looks to the left has led to the suggestion that this image formed part of a pair. However, the sitter’s rank would make it unlikely that he would be located on the right side, which was traditionally the less important side, and the only figure who could occupy the other side would be his grandfather, Maximilian I. It has also been suggested that the panel formed part of a series of portraits of sovereigns commissioned by the Reformers as a present for the Emperor. The painting was formerly in the Von Wallenberg collection in Illnisch, Silesia, entering the Thyssen-Bornemisza collection in 1933.